Gavin dashes to the window. No Danielle stomping back home. "Come on, let's hurry," he says over his shoulder. He reaches way underneath Danielle's bed, and pulls out the candy. "Why does she keep it under her bed?" Richard whispered. "To hide it from me," Gavin laughs his cackle laugh. Richard smiles. "No touching Danielle's things, Richard," he warns. He picks up the tin and gets the top off. He picks two, then carefully spreads out what's left to fill the empty spaces, and pushes the tin back under Danielle's bed. Then, just as he stands up, he hears, "Hey, CATCH!" Richard is sailing Danielle's snow globe--the one she got when her middle-school choir traveled to New York, the one made of heavy glass and not plastic--right at Gavin. Gavin thought that having Richard over after school meant that at last he had found a friend at his new school, Carver Elementary. But when Richard pronounces his educational video games boring, Gavin comes up with something he thinks will impress Richard, a chance to fool his bossy big sister and have some candy besides. But when Danielle's snow globe shatters on the floor, his impromptu plan lands him in big trouble. Danielle knows instantly who was in her room, and Gavin finds himself grounded. Worse still, his Aunt Myrtle shows up for a short visit with her disagreeable dog, Carlotta, just as Gavin's parents are looking for a suitable punishment for the snow globe incident. And true to form, Aunt Myrtle has a unwelcome suggestion. "Why, I think Gavin here should pay his sister what that thing cost. I'll let him walk Carlotta. It'll be his little job, to learn the value of a dollar." Carlotta is a pampered Pomeranian who growls and shows sharp little teeth that look as if they would like to sink into Gavin's ankles whenever he walks by. And she never goes out without two pink bows on her ears, a pink sparkly collar and leash, and her beloved slimy Chew-Chew in her mouth. Gavin knows right away that the kids in his class are not going to be impressed when they see him dragging Carlotta along, and to make things even worse, Aunt Myrtle makes him carry a special plastic bag to pick up her poop. Gavin hates to think what horrible nickname class bully Harper is going to hang on him when he sees him scooping dog poo at the park. Not cool. Gavin knows that'll be the kiss of death for ever making friends at Carver. But despite himself, Gavin begins to enjoy the dog walking just a little, especially when he figures out that he can skateboard while he walks Carlotta. Richard admits that trick is sorta awesome, and Gavin begins to hope he can make it through the five days of Aunt Myrtle's visit without any more damage to his reputation. And then, while Gavin is at school, Carlotta digs under the backyard fence and disappears. Despite himself, Gavin is worried about Carlotta and feels that it is his job to find her and is happy that Richard loyally offers to help him search the neighborhood. 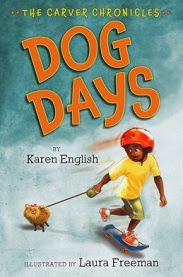 In the first book of her Carver Chronicles series, Dog Days: The Carver Chronicles, Book One (Houghton Mifflin Clarion, 2013), Karen English's Gavin is a typical third grader, trying to thread his way through the social situation in a new school, complete with bossy girl Deja and her best friend Nikki, and the overgrown Harper, who knows Gavin saw him shoplifting and is looking for a chance to catch him alone, and a bunch of other kids who don't yet see Gavin as a good friend. Gavin is an likable character and English's setting and artist Laura Freeman's many humorous illustrations promise plenty of possibilities for future adventures on the school and home front for young readers, especially boys, looking to move up to beginning chapter books. Karen English, who has already set the scene for this new series in her popular Nikki and Deja books, has shown the writing chops for this genre and has made a promising start in this first book in her new series. Another proven series for boys ready to move on to easy chapter reading is Andrew Clements' funny, poignant and altogether estimable Jake Drake books.